The Great Disruption: Why the Climate Crisis Will Bring On the End of Shopping and the Birth of a New World | Free eBooks Download - EBOOKEE! Posted on 2012-08-22. By anonymous. Gilding, former director of Greenpeace International and now on the faculty at Cambridge University's Program for Sustainable Leadership, proposes that global warming is just one piece of an impending planetary collapse caused by our overuse of resources. According to the Global Footprint Network, we surpassed Earth's capacity in 1988, and by 2009, we needed the resources of 1.4 planets to sustain our economy ï¿½and any increases in efficiencies that some claim will solve the problem are likely only to encourage us to use more. Gilding argues that, like addicts who need to hit bottom, we energy users will deny our problem until we face head-on the risk of collapse,? but when we do, we will address the emergency with the commitment of our response to WWII and begin a real transformation to a sustainable economy built on equality, quality of life, and harmony with the ecosystem. Gilding's confidence in our ability to transform disaster into a happiness economy? may astonish readers, but the book provides a refreshing, provocative alternative to the recent spate of gloom-and-doom climate-change studies. 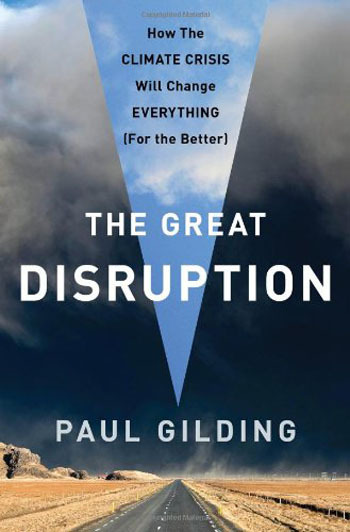 No comments for "The Great Disruption: Why the Climate Crisis Will Bring On the End of Shopping and the Birth of a New World".